I always thought you needed expensive fancy fresh crab meat to make crab cakes. But you can really make them with the canned crab you can find in the store. Maybe they would be better if they were all fresh and fancy, but you are gonna break it all up anyways. So I don't think it's a big deal. 1. Take your crab meat out of the can, and place it in a mix bowl. Break it up with a fork so it isn't in chunks, but nice and flaky. Then add one egg (white and yolk) into the bowl. Sprinkle with salt and pepper. Mix contents of the bowl together. 2. On a cutting board, finely dice red pepper and some onion (though the onion would be optional). Then add these to your bowl of crab. Instead of using bread crumbs to help bind our crab cakes, say like a burger, add a tbsp spoon or soon of flour. Add enough so that the mixture isn't soggy and wet. 3. Form crab mixture into balls that will be flattened into patty size. About the size of a kiwi, or maybe a little bigger. In a frying pan, heat some oil or butter on medium heat, and place your crab balls in pan. After places a ball into a pan, flatten it down a little with a spatula. 4. Cook crab cakes on both sides until you get a brown crust on both sides. To should help to ensure that the crab cake is cooked through. 5. For a side salad, mix some arugula with cut up pear, fried bacon, and an oil and vinegar dressing. You could even add some shavings of parmigiano-reggiano. 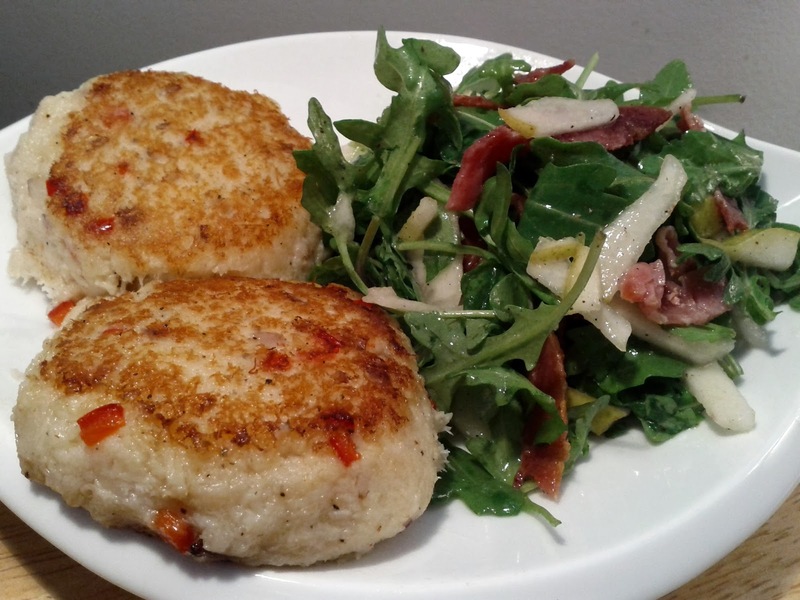 Either way, arugula is a good accompaniment to the crab cakes.